Monterey is a rewarding retreat for just about anyone. Adventure seekers, history buffs, foodies and families alike are consistently pleased and coming back. Learn how to scuba dive, go deep-sea fishing or opt for a whale watching cruise to spot orcas and grey whales. Others might ride a surrey along the seal studded coastline or spot sea otters by kayak atop kelp a bed. History buffs will enjoy visiting the old jail at city hall, California’s first capital building where our state constitution was written, or tour the custom house and the adjacent plaza. It was here where California was first declared a state. Monterey will satisfy the most discerning foodie with inventive regional dishes and world class wines. Wine Enthusiast named Monterey one of the top ten wine destinations in the world, surpassing better known Sonoma County and Napa Valley. This small city showcases a plethora of restaurants boasting Californian coastal cuisine as well as authentic restaurants from traditions abroad. The most famous destinations in Monterey are certainly worth a visit, but many of the area’s treasures lie in the historic Old Monterey (predating Cannery Row by as many as 150 years). Old Monterey in the vicinity of Alvarado Street is where you’ll find the pulse of locals taking coffee, dining out and going about their business. The many historical sites and good restaurants in this compact area are easiest to explore on foot. The Monterey Bay Aquarium truly is a must see for any age and well worth the $35 admission. Fisherman’s wharf and Cannery Row, while decidedly touristic in vibe, are the places to go to catch a whale watching cruise, find bike rentals and several good restaurants. Adjacent Pacific Grove is an authentically quaint solace amid 19th century Victorians and charming cafes. Pacific Grove also boasts some of the most scenic coastline ideal for a coastal walk along tide pools, and surpasses 17 mile drive in terms of scenery, activities, and value (it’s free!). Ocean View Boulevard meanders the rocky coastline connecting Lovers Point park and Asilomar State Beach before terminating at the gate into 17 Mile Drive. Monterey Bay Aquarium- definitely worth a visit for the up close experience of sea otters at play and towering glass windows into a kelp forest complete with sharks, deep sea sunfish and 500 lb. tunas. You can see penguins contemplate a swim and pet a sea ray as it swims past. Cannery Row- The set of one of John Steinbeck’s classic novels, Cannery Row is now somewhat of a theme park in his honor. Hidden among the tourist shops are a few good oceanfront restaurants like The “C,” The Chart House, Schooners, happy hour at the Sardine Factory, and a couple four star hotels. Several bike and surrey rental companies are dotted along the row. Fisherman’s Wharf- This old pier is home to a collection of restaurants and excursion companies which offer whale watching and fishing trips. 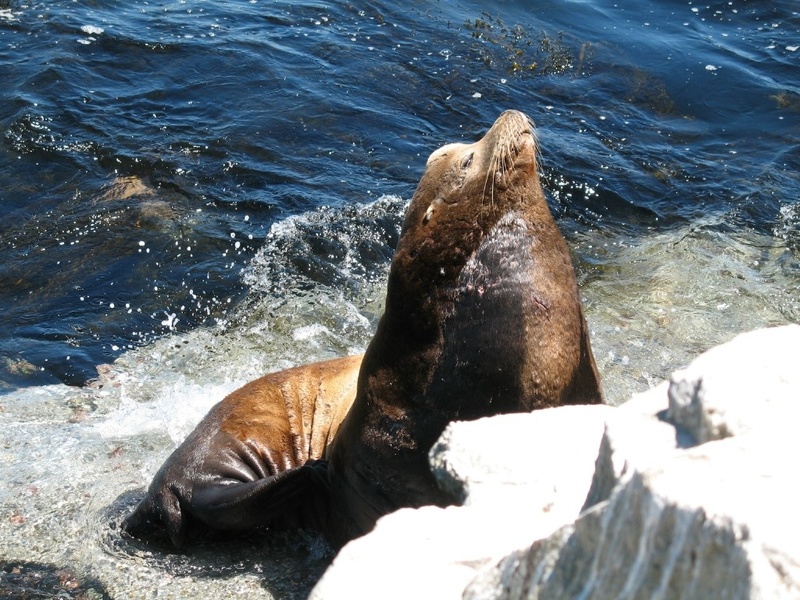 Here you are sure to see sea lions piling themselves upon a barge and groaning at one another. Free samples of very good clam chowder will draw you in to a restaurant for happy hour. Alvarado Street- The center of downtown and Old Monterey, the streets surrounding Alvarado are where you’ll find the more authentic vibe of local restaurants, coffee shops, open mic night and our largest farmer’s market. Near the library and city hall restaurant 1833 has serious old world vibe and the best cocktails in town. Recreation Trail- The old Southern Pacific railroad line has been paved providing a traffic-free path for runners and cyclists to get some exercise while taking in the Monterey and Pacific Grove oceanfront. The path continues for 17 miles along the coast past the towns of Seaside, Marina and Castroville. This path is the best way to check Fisherman’s wharf and Cannery Row off your list as the recreation trail connects the two with a scenic meander along the harbor. Dennis the Menace Park, Skate Park & Volleyball- If you’re traveling with kids this park is awesome. There’s an old steam train locomotive parked at the entrance for kids to climb on, a water fountain inside a giant lion’s mouth, and countless structures and bridges for little ones to let loose. There is an adjacent skate park that’s free to use but requires a helmet. The park is surrounded by horsehoe-shaped lake El Estero. Across Del Monte Avenue from the park are volleyball courts at Del Monte Beach. Farmer’s Markets- Alvarado street in Oldtown Monterey has the largest market every Tuesday from 3-7. Monterey Peninsula College has another in its lower parking lot Fridays 10am-2pm. The markets are a buffet for the senses, where you can indulge in local root beer and produce, calamari or artwork.